Those with Alzheimer's dementia walked slower than those with MCI, who in turn walked slower than those who were cognitively healthy. I read the research reported below with great interest. Why you might ask? Years before my mother was diagnosed with probable Alzheimer's I noticed that she started walking slower, and started "scrapping" her feet on the ground. The sound of her feet was disconcerting not only to me, but also, to my sister Joanne who also noticed the difference in the way my mother walked. Every single person I mentioned this to, including three different personal care doctors, all said the same thing, "she is getting old". I can now say that this was a very clear symptom of cognitive decline and the onset of Alzheimer's disease in Dotty. I have written on the this topic for several years, trying to alert the public and the Alzheimer's community that this can be an early sign of dementia. There are a serious of research reports coming out right now that address this issue. The research below is the first of several articles I will be publishing on this topic. Gait disturbances – such as a slowing of walking pace or a more variable stride – could indicate a decline in cognitive function, according to new research studies reported today at the Alzheimer's Association's International Conference® 2012 (AAIC® 2012). "With an aging baby boomer generation advancing into greater risk for Alzheimer's and dementia, it is important for physicians to be aware of the associations between gait and mental function. These studies suggest that observing and measuring gait changes could be a valuable tool for signaling the need for further cognitive evaluation," said William Thies, PhD, Alzheimer's Association® Chief Medical and Scientific Officer. "For busy doctors who have limited time with their patients, monitoring deterioration and other changes in a person's gait is ideal because it doesn't require any expensive technology or take a lot of time to assess. It is relatively simple and straightforward," Thies added. 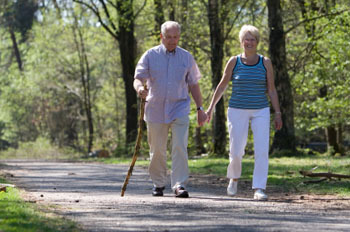 Difficulties with walking are not inevitable consequences of aging. They are, however, common and relevant problems among older adults. Research shows that people with walking difficulties not only have an increased risk of falling, but may also have an increased risk developing memory disorders and dementia. Stephanie A. Bridenbaugh, MD, of the Basel Mobility Center in Basel, Switzerland, and colleagues used quantitative gait analysis to explore this issue. The study followed 1,153 participants (average age=77) including outpatients from the Basel Memory Clinic and Basel Mobility Center, plus cognitively healthy participants in a Basel cohort study, from 2007 to 2011. Participants were divided into groups based on their cognitive diagnoses: cognitively healthy, mild cognitive impairment (MCI) or Alzheimer's dementia. Those with Alzheimer's dementia were subdivided into mild, moderate or severe. Gait was measured using a 10-meter-long electronic walkway with almost 30,000 integrated pressure sensors. All participants performed one "normal" walk and two different "dual tasks" – normal walking while simultaneously counting backwards out loud or while simultaneously naming animals. The scientists found that gait became slower and more variable as cognitive decline progressed. For all groups, walking speeds were slower during dual tasking than during normal walking alone. "Those with Alzheimer's dementia walked slower than those with MCI, who in turn walked slower than those who were cognitively healthy," said Bridenbaugh. "Mobility impairments are often associated with dementia, and some gait changes may even appear before cognitive decline can be detected by traditional testing methods. Gait analysis can simply, quickly and objectively measure walking. When problems emerge, this may provide early detection of fall risk and the earliest stages of cognitive impairment in older adults," Bridenbaugh added. "A gait analysis will not replace a comprehensive neuropsychological assessment to diagnose a patient's cognitive status. Gait analysis, however, may prove to be an important tool to aid diagnosis, and record treatment effects or disease progression." Stephanie Bridenbaugh, et al. How does gait change as cognitive decline progresses in the elderly?